Actually, I haven't been out on the plaza because it's been a bit wet and rainy this week. That's fine by me, I have had a lovely quiet time with my micron pens and this large piece of Stonehenge cotton paper. It sure is fascinating to see the different tiles that decorate any plaza floor and to sit with a coffee, people watch and absorb the scene.This week I created my own plaza by drawing around Zentangle tiles, linking them and adding embellishments. It certainly isn't architecturally correct but that is the fun of being abstract, I hope you enjoy the view. It's so fun seeing your posts ... my gosh I really appreciate the time you spend on creating you art!! And the size is crazy! Great piece. It looks like some of those patterns are breaking out of their tiles and trying to run off! Always such a delight to enjoy your art. I love your freedom and it is so inspiring! Michele ~ this is stunning! I love your art! What a delightful piece Shelley! Very airy and light as if the squares are floating. Your detail is impecable as always! Your designs are like an adventure for the eye, one can read and search through them. Thanks for sharing your talent. Gorgeous gorgeous gorgeous....what else is there to say? Your work is always so inspiring Shelly! Very very fun! I always love your work. Like the variety of this. It is like creating your own ensemble but not putting them together in a linear pattern. Love it. 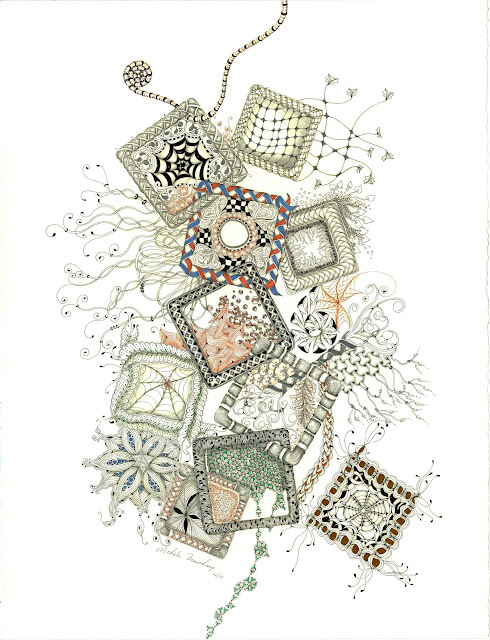 It is a unique tangle sampler. Any idea of how many different tangles you used. Really like the different tendrils going off in the different directions. wow Michele, this is beautiful. What a great sampler, I love your style! Oh my - viewing your work is always such a joy - this one a show stopper extraordinaire! To say that I love your work is an understatement! The softness yet solidness you bring to your work is something I strive to depict. I am fairly new to Zentangle, but it has been an addiction for me!!! I can totally see how my tiles have changed as I grow into the art, but I would love to have just a tiny bit of your style!!! Just beautiful!! Words fail me. This is such an amazing piece. Thank you so much for all your kind and thoughtful comments.